Pedors is an orthopaedic stretch shoe company based out of the USA. www.pedors.com Pedors was founded by brothers Stephen & John O'Hare in 1997. Pedors has enjoyed considerable success in the stretch orthopaedic shoe market, this seems reasonable as they are the award winning inventors of the original stretch shoe! FitnWell Footwear is proud to be the Master Distributor for the Pedors® brand for Australia. The owners of FitnWell Footwear are Carlene Gabriel and Steve Masters. 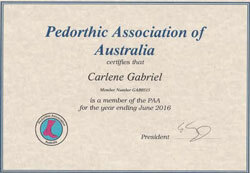 Carlene and Steve’s research led them to Pedors Shoes. Not only are they one of the top brands in Orthopaedic Footwear in the U.S.A. with a worldwide distribution, they also happen to be extremely professional, competent, community minded and just the type of company FitnWell Footwear are more than happy to be associated with. We've worked with Pedors for a few years now, we've seen first hand that their shoes cover a multitude of foot problems and abnormalities often negating the need for expensive custom made footwear. The Pedor’s Classic is one of the leading shoes in Aged Care in the U.S.A. Pretty soon their millionth pair will roll off the production line. If staying power is any marker then Pedors are top of their class! Pedors truly are a market leader in the U.S.A and around the world. We're extremely proud to be offering, for the first time, the full range of Pedors Shoes in the Australian marketplace.